Deuteronomy 16:18-20 “You shall appoint judges and officers in all your towns that the LORD your God is giving you, according to your tribes, and they shall judge the people with righteous judgment. You shall not pervert justice. You shall not show partiality, and you shall not accept a bribe, for a bribe blinds the eyes of the wise and subverts the cause of the righteous. Justice, and only justice, you shall follow, that you may live and inherit the land that the LORD your God is giving you. Love and Stockholm Syndrome: The Mystery of Loving an Abuser by Joseph M. Carver, Ph.D., Clinical Psychologist. Throughout history, people have found themselves supporting and participating in life situations that range from abusive to bizarre. In talking to these active and willing participants in bad and bizarre situations, it is clear they have developed feelings and attitudes that support their participation. One way these feelings and thoughts are developed is known as “cognitive dissonance”. As you can tell, psychologists have large words and phrases for just about everything. Heavy smokers know smoking causes lung cancer and multiple health risks. To continue smoking, the smoker changes his cognitions (thoughts/feelings) such as 1) “I’m smoking less than ten years ago”, 2) “I’m smoking low-tar cigarettes”, 3) “Those statistics are made up by the cancer industry conspiracy”, or 4) “Something’s got to get you anyway!” These new cognitions/attitudes allow them to keep smoking and actually begin blaming restaurants for being unfair. And guess what those “new thoughts and attitudes” are going to be? That the victim has it all wrong. That the victim is really the culprit. Because the alternative (that the pastor has been duped by the abuser; that the abuser is not at all who the pastor thought him to be, etc), is just too shocking and threatening to face up to. The dissonance between the victim’s report of abuse and the pastor’s longstanding “knowledge” of the abuser must be resolved into a pleasant, harmonious chord once again. And it will be at the expense and sacrifice of the victim. You must not yield to any of this. Yes, there is a dissonance. 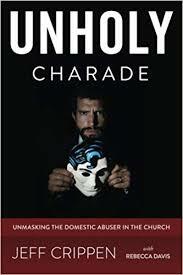 But the dissonance is coming from the abuser’s “Christian” facade as it is now played against the other note of his role as abuser. Resolution must be sought in the abuser’s arena, not in the victim’s. Our false notion of who the abuser is must be a note that is changed. That will be real resolution.